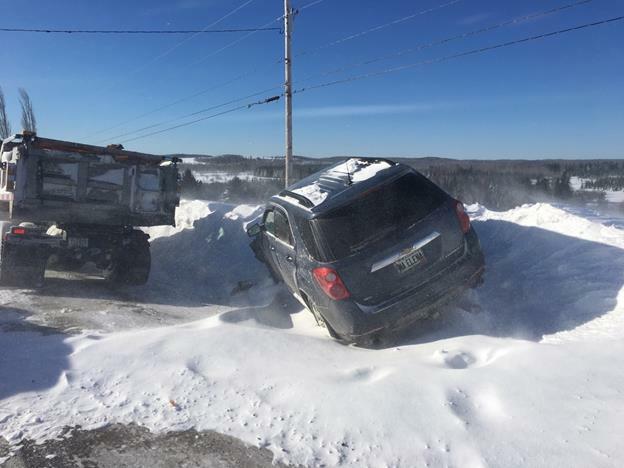 White out conditions in northern Maine Tuesday morning contributed to an 11-vehicle crash on Route 1 that injured two people, including a local police chief who suffered broken bones, State Police said. The crash involved a police cruiser, two state plow trucks, a pickup truck and seven passenger vehicles traveling in Cyr Plantation, State Police said in a statement. Van Buren Police Chief Michael Bresette, who responded to the crash, was struck by a car as he stood outside his cruiser. He suffered multiple broken bones and narrowly missed being struck a second time, State Police said. “After being struck, he dragged himself out of the road to avoid being srruck a second time by an uncoming truck,” the statement said. The operator of a state Department of Transportation plow truck was also struck and injured “while he was on foot at the scene,” State Police said. Occupants of the vehicles were also injured in the crash. All were taken by ambulance to Cary Medical Center in Caribou for treatment. Some were treated and released, while others were still recovering Tuesday night, the statement said. Multiple state and local agencies responded to the scene. The cause remains under investigation.